Our two and four-bedroom pet-friendly cottages combine style and semi-privacy for your personal retreat. Enjoy the scenery from your veranda or cozy up to the fireplace for a relaxing evening in your shared living room. Keltic Lodge at the Highlands offers two types of shared cottages. 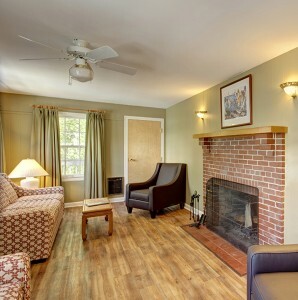 Each of our five two-bedroom cottages and five four-bedroom cottages include spacious shared living rooms, cozy fireplaces, with private guest rooms including private ensuite bathrooms. All cottages feature ocean views on the Middle Head Peninsula with a rustic feel that provides all the comforts of a home away from home. Our executive cottage offers the sound of crashing waves and world-renowned views. Guests can enjoy three bedrooms and two full bathrooms with a private cliff-side backyard. Entertain in the comforts of your own suite with spacious living and dining rooms. Plus, the full kitchen gives you all the space and utensils you need to prepare a fresh, locally-caught seafood dinner. Or you can have our Culinary Team prepare and serve it for you.